Pore storage facilities are created exclusively for storing gaseous media. They are particularly suitable for storing the large quantities of gas that are necessary for seasonal changes in demand. 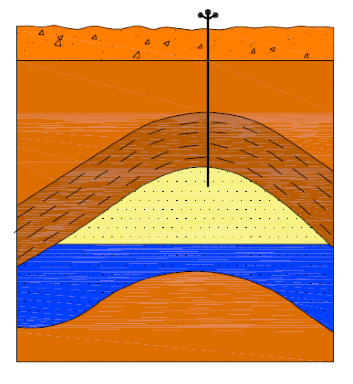 Artificial gas storage deposits can be created in aquifer structures – i.e. structures with porous, water-bearing horizons – where the water in the porous volumes of the layer is displaced by the gas under pressure. an edge water reservoir that can accommodate the displaced water during the gas injection.